Is there any explanation around that tries to tie what’s called the Rheinische Verlaufsform in German (“Ich bin am Laufen”—lit. “I am at running”—instead of “Ich laufe,” if the action is perceived as ongoing) to non-Germanic roots? In addition to the Rheinische Verlaufsform in German, there is also a continuous form in Spanish verbs: e.g. estoy cantando meaning roughly “I’m always singing” (and probably driving my neighbours mad) as does Italian (io sot leggendo = I stand reading). We’ve seen MacDonalds popularise the phrase “I’m loving it!” in the last twenty years or so. I’ve sometimes seen this linked with the ascendancy of the Welsh-origin Tudor dynasty (Henry VII was Welsh-born; he came to the throne in 1485). It’s a suggestive coincidence, although it seems an unlikely explanation. Thomas: Not that I know of, but all I know about the Rheinische Verlaufsform is that it exists. Catherine: And from what I understand, this construction also appeared in Latin and occasionally appeared in Old English, but mostly in translations of Latin texts. But perhaps this construction influenced the development of the progressive in English, especially as forms like be + present participle and be + on + gerund collapsed together. dw: It is interesting, but I agree that it’s unlikely. I suppose it’s possible that a new Welsh-born nobility could influence the language, just as the Normans obviously shaped Middle English. But if that’s the case, then there should be good evidence for it, and I haven’t heard of any. Spanish has a progressive form made with estar and the gerundio — estoy yendo = I am going. I think other Romance languages (Italian perhaps) have something similar. Many times people entering a shop would tell the shop assistant “I’m after a pound of butter”, and more elderly shoppers would use “I’m after buying a pound of butter.” This, in (not ireland) a New Zealand corner shop, back in the 60s & 70s. In current use in motor parts and accessories, or hardware & tools. Eudora Welty used this “after-perfect” construction in the dialog of a number of her short stories set in rural Mississippi. Lynne and Everett: Fair point. I should have specified that I meant Standard English and not regional dialects. But that just underscores the original question: we definitely see more Celticisms in regions with greater Celtic populations, but if most of England had a bilingual Celtic population at one point, then why don’t see them all over? Very fun read, thank you. What I want to know is, was that last line written just for fun, or is it a teaser? She’s after coming is a common turn of phrase in Ireland. After is used often in the country. Things like “I do be going ” etc…not considered educated but valid in the spoken language. …new Zealand is full of Scots. I think it proves your point nicely. It’s definitely not ever heard in England. My favorite extreme-Hibernian syntax: “‘Tis an ease to the gate they to be married”, meaning the couple will stop leaning on the gate in the fence between their lands and talking together, now that they are living in the same house. Thorn þ was a holdover from the runes and lasted until the coming of the printing press which didn’t hav the letter! Often y with a superscript e was noted and thus the befuddling “ye olde … ” where ye=þe (the). Interesting! I knew that thorn was runic and eth was brought by Irish monks, but I didn’t know it had anything to do with spelling reform. It makes sense that scribes would use them interchangeably, though, because there wasn’t a phonemic difference between voiced and voiceless fricatives at that point. Just wanted to mention that in German, “tun” (“do”) is also used as auxiliary verb, in particular in some dialects, and by speakers of standard German under the influenced of these dialects. I’m not suggesting that this explains the phenomenon in English, but there may already have been a fertile ground for the development of the modern use of “do” in the Western Germanic languages. Thanks for that. I think I’ve heard that there are a few similar constructions in dialects of other languages, but I didn’t know enough to comment on them. However, this is to confuse an *actual* instance of the preposition ‘after’ with an -ing verbal noun (as in I’m after buying a pound of butter) with a grammatical usage where the preposition ‘after’ *replaces* the auxiliary ‘have’ in the perfect (as in ‘I have bought a pound of butter’). If we accept that one of the uses of the present perfect is to indicate the *recent* past, then it can readily be seen that the verb phrase ‘she has come’ is equivalent to ‘she is after coming’. In other words, the preposition ‘after’ in the Celtic construction ‘she is after coming’ is used in a *literal* sense of ‘she is after (the act of) coming’ or, in Modern English, ‘she has (just) come’. This usage is different from ‘I’m after buying a pound of butter’, which could be restated as ‘I am after (an act of) buying a pound of butter’ In this restated phrase, it can be seen that the preposition ‘after’ is used in its actual prepositional sense, and not as a replacement for the perfect auxiliary ‘have’ (as in the Celtic construction ‘she is after coming’ or in Modern English, ‘she has come)’. In other words, ‘I’m after buying a pound of butter’ is not the same as in ‘She is after coming’. In the first verb phrase (‘I’m after buying’) the preposition ‘after’ signifies a sense of ‘seeking’, but in the latter phrase (‘She is after coming’), the preposition ‘after’ is being used as an auxiliary, to signify that ‘she is here,* having* just come’. This is my reading of the Celtic syntax, in any case. Constructions such as ‘She is after coming’ in Scots Gaelic do provide some evidence of the Celtic substrate theory, in my humble opinion. You’re right that there are a lot of possible other features that I didn’t consider. But I think McWhorter’s version of the theory, which is that most of the inhabitants of Great Britain were speaking a Brittonicized English that didn’t appear in writing until Middle English, has some major problems. If do support and the progressive tenses are evidence of Celtic influence, and if that Celtic influence wasn’t evident in writing in Old English because scribes were using a learned form of the language that didn’t match the vernacular, then we would have expected do support and the progressive tenses to appear in writing shortly after the Norman invasion and not a few centuries later. To be fair, the default argument must logically be that there is a degree of Celtic influence and Germanic influence that combined to become Old English. Obviously Germanic influence was greater. Considering the differences between Old English and Germanic dialects of the time there must have been some influence to account for the changes. Celtic is the most logical reason. Therefore any investigation of this must start from a point of disproving such influence, if its influence is to be disputed. The burden must be on those who claim less likely influences or causes as agents of change. This isn’t actually a logical argument at all, and it’s not at all clear why you think it should be the default. 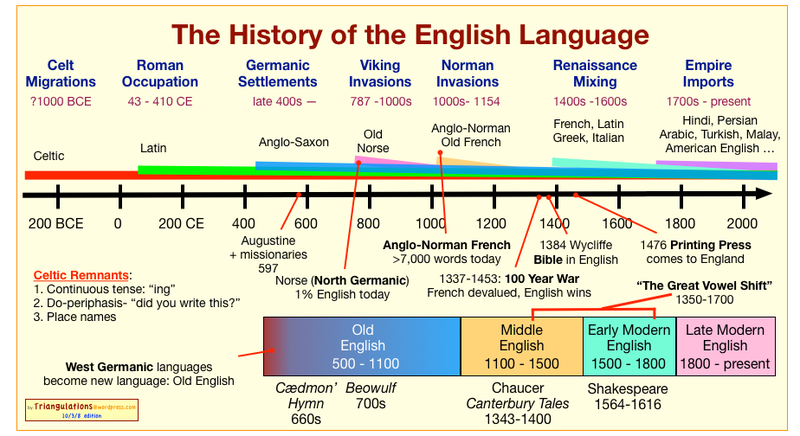 For one thing, Old English is not very different from other Germanic dialects of the time. Around the time the Anglo-Saxons started settling in Great Britain, their language was really part of a dialect continuum that included the ancestors of modern-day Dutch, High German, Low German, and Frisian. Furthermore, this isn’t how historical linguistics works. You don’t assume a connection between two otherwise unrelated languages and then force everyone else to disprove it. The null hypothesis is that there’s no relation unless you can demonstrate otherwise. What you’ve really done is made an observation (“Old English is different”—though it really isn’t that different) and stated a hypothesis (“it’s different because of Celtic influence”). How are you going to know whether your hypothesis is true or not unless you prove it? here in Bavaria the use of “tun” (German cognate of “to do”), as in his examples, is widespread.